Yoon Mi Rae was invited to KoreAm/Audrey Magazine’s annual Unforgettable awards ceremony held on December 5th at the Park Plaza Hotel in LA. 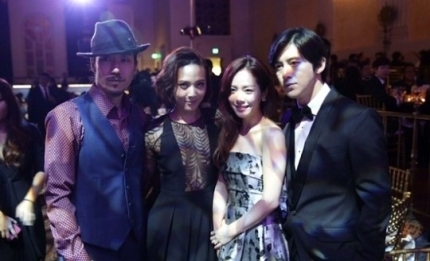 She was joined by fellow MBFTY crew members, Tiger JK and Bizzy. This annual event, sponsored by US London Trust Media (LTM) brings successful Asian-Americans from all walks of life ( entertainment, journalism and sports) and recognizes them for their achievements. Psy, Actor Sandra Oh, and golfer, Park Se Ri, were some of the people who attended previous ceremonies. This year, baseball player Park Chan Ho, actor John Cho, and Youtube Sensation David Choi were present. Yoon Mi Rae was nominated for “Best Global Artist” and attended with her crew members, Tiger JK and Bizzy. Actors Go Soo and Han Ji Min were nominated for being actors with high expectations in 2015. Singer G.na along with DJ Smells performed on stage and got a positive response, but it was Yoon Mi Rae that stole the night. Being invited 2 years in a row, there was media frenzy whilst she was performing on stage. Yoon Mi Rae, is due to come back on stage with her new single, “Angel,” with Tiger JK and Bizzy featuring on the track. Side Note: We were tweeting reports and photos as the night progressed. See photos here.